Lifeline is a clean, fully responsive, highly flexible and beautifully designed WordPress theme which is provided with six (6) unique homepage layouts to best suit the advanced requirements of your website. This can be used as a Charity WordPress Theme, Fund Raising WP Theme or NGO WordPress theme to build a website for your organization..
To promote the ranking of your site, our skilled professionals have constructed it with latest search engine friendly parameters, viz. built-in SEO, fast loading and cross browser compatibility. Thousands of charity organizations are working around to globe to help the poor. These organizations need online donation system to collect money to run their campaigns. Lifeline is the best solution for such Non-Profit organizations as it has built in Fund Raising or Donation system to raise the required money through Paypal or by selling some products online. 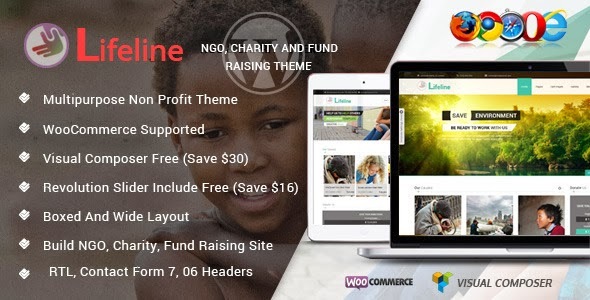 Item Reviewed: Lifeline NGO Charity Fund Raising WordPress Theme 9 out of 10 based on 10 ratings. 9 user reviews.